Returning racer Ben Hingeley made it an extremely impressive opening day of the 2016 Duo BRDC British Formula 3 Autumn Trophy proceedings as he claimed a clean sweep of afternoon practice sessions on Thursday, ensuring he only failed to top the timing screens in one of the four hour-long sessions across the day. As the action resumed after lunch, the drivers in the field were keen to get in as many laps as possible with Hingeley, who has joined Fortec Motorsports for this weekend, setting the initial pace. Double R Racing’s Dan Ticktum soon took over at the top though ahead of his Kiwi team-mate Marcus Armstrong, the 16-year-old just 0.082s slower in second. As the third session moved into its closing stages, Ticktum continued to lead the way from Armstrong with South African Callan O’Keeffe moving ahead of his Fortec team-mate Hingeley into third. 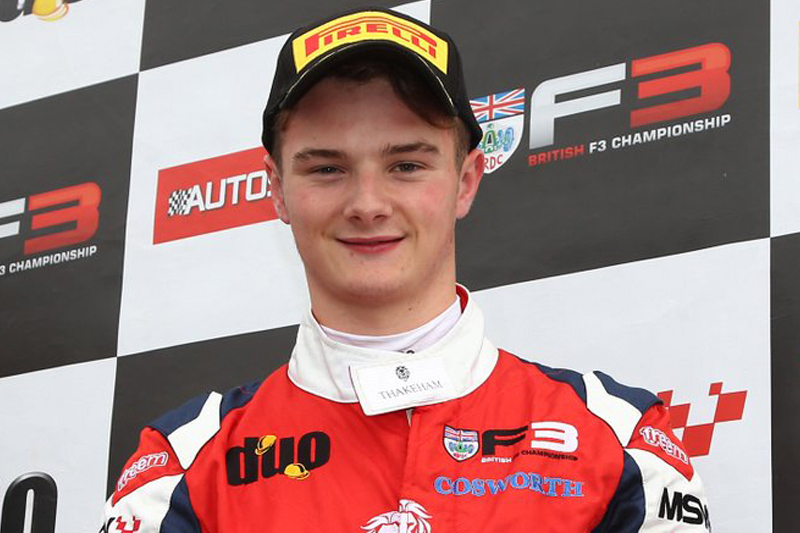 German F4 Champion Joey Mawson was fourth with Reddy fifth, as just eight-tenths of a second covered the top 11 drivers. It looked like the order would remain that way but on his very last lap of the session, BRDC British F3 podium finisher Hingeley pulled out a superb lap, touring the 300 circuit in 1m43.271s, to claim top spot. The final hour-long session of the day had a familiar feel to it as the Double R pairing of Armstrong and Ticktum were spotted at the top of the timing screens early on, with the Carlin duo of James Pull and US F4 Champion Cameron Das showing well in the top-five. Hingeley soon got into the fight for top spot, bettering the mark set by Enaam Ahmed, who briefly led the way, by just 0.004s as the session moved past its halfway point. 16-year-old Das was not done there though and the impressive youngster jumped ahead of the rest of the field with 15 minutes remaining, a 1m43.756s putting him 0.056s clear of Tarun Reddy who moved into second and 0.091s clear of Carlin team-mate Pull in third. That led to a flurry of activity as every driver seemed intent on showing just how fast they could go, leading to a fascinating last 10 minutes of running in the day. Eventually, after it had all shaken out, it was that man Hingeley who was once again leading the way on a 1m43.227s. That was just 0.069s clear of both Joey Mawson and Callan O’Keeffe, with the pair setting identical times. Dan Ticktum was only two tenths shy of the leader but had to settle for fourth with Ahmed fifth, Reddy sixth and Pull seventh. Such was the close nature of the field, less than a second covered Hingeley in first down to Armstrong in 11th. Friday’s testing action begins at 09:30 with four, 30-minute sessions scheduled throughout the day. You can follow all the action through live timing and updates on the official British F3 website.